Transform your home with our irresistible Feu De Bois fine fragrance blend of birch, oakmoss, cedarwood and musky patchouli, presented in a pure, natural wax candle and a luxury reed diffuser. Exclusive to Parks, this luxury home fragrance gift set makes the perfect present, or a special treat to help infuse your home with captivating fragrance. A triumph of wood, musk and spice, our Feu De Bois Candle & Diffuser gift set introduces a blend of perfectly balanced luxury fine scents to your home, helping to create a sophisticated and tranquil environment. Our skilled perfumers have poured a handful of fine fragrances into this enchanting blend, creating a bold and invigorating home scent that’s perfectly suited to any living space. Here, the earthy blend of oakmoss, birch and cedarwood provides a potent base note, giving this woody bouquet richness and depth. The blend is heightened and elevated by the addition of patchouli, whose spicy and musky floral aroma brings an invigorating top note, adding complexity and strength to the scent. The Feu De Bois luxury gift set includes an elegant pure natural wax candle, which offers up to 50 hours of burn time, and a luxury reed diffuser complete with authentic rattan sticks that help to deliver long-lasting fragrance to your home for up to 12 weeks. 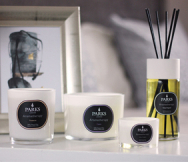 Supplied in a luxury presentation gift box, the exclusive No.8 home fragrance collection from Parks makes the perfect gift for anyone passionate about filling their home with the finest, natural fragrances.